When running down the list of important sports and entertainment events hosted by the venerable Madison Square Garden, the Thoroughbred industry is not a genre that immediately comes to mind. However, the historic venue and Fasig-Tipton played crucial roles in one another's early development. Both entities have undergone figurative and literal ground-up overhauls since January 1899, when William B. Fasig sent a telegram to the media announcing he and Ed Tipton had incorporated as Fasig, Tipton & Co. 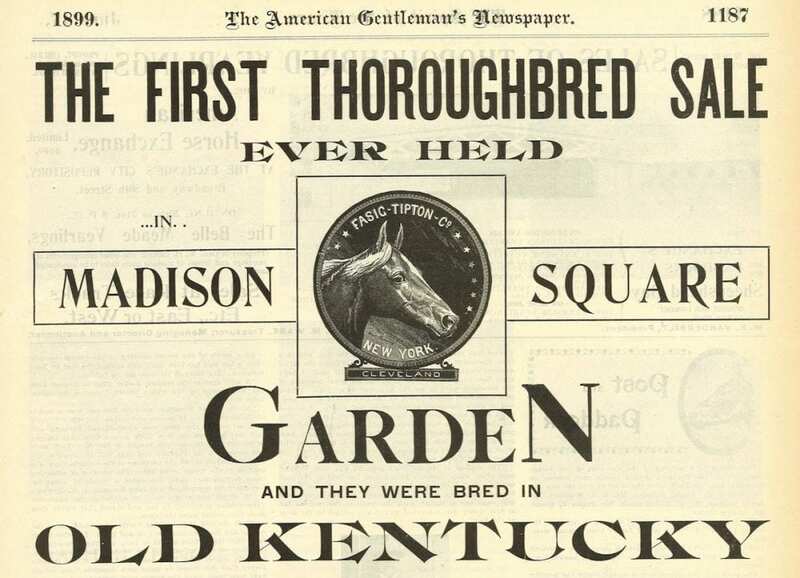 The Garden was in its second of four incarnations when Fasig-Tipton was formed, located on the corner of 26th Street and Madison Avenue in Manhattan. It was first constructed in 1874, then it was demolished and replaced with a bigger building in 1890. The venue was then rebuilt uptown in 1925, to the corner of Eighth Avenue and 50th Street, and the modern version of Madison Square Garden opened atop Penn Station between Seventh and Eighth Avenues and 31st to 33rd Streets in 1968. Fasig was a longtime tenant of the Madison Avenue incarnation of the Garden before he went into business with Tipton. It served as the base of operations for Wm. B. Fasig & Co., and it was a regular host of his auctions, which primarily offered horses designed to be paired with wheels – carriage horses and Standardbred racehorses – with some Thoroughbreds. Described by sporting newspaper The Spirit of the Times as “certainly one of the most popular horsemen of America,” Fasig was a manager and influential figure at Standardbred tracks around the country. In addition to hosting sales at the Garden, he also held a regular auction for Standardbreds in Cleveland, Ohio. Tipton, a Kentucky native, was a prominent executive with the Kentucky Trotting Horse Breeders Association and a stud farm manager before buying in with Fasig. He was elected to the Harness Racing Hall of Fame in 1959. In the weeks following the announced partnership, Fasig had one more sale to handle under his own banner at Madison Square Garden. A February blizzard that settled over New York hampered the returns, but Tipton was in attendance, not only to make connections and prepare for his new position, but to buy some horses. The first sales under the Fasig-Tipton banner were held in New Jersey and Cleveland, focusing on Standardbreds. 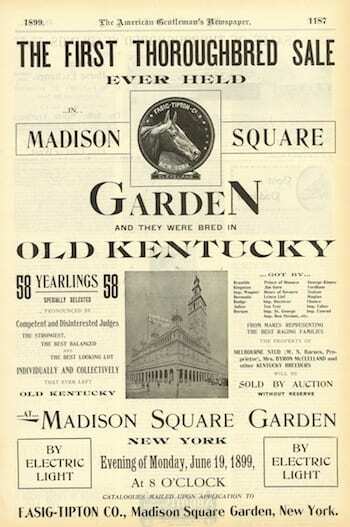 When the company returned home to Madison Square Garden, its first sale offered Thoroughbred yearlings, held on the evening of June 19, 1899. Billed as the first Thoroughbred sale ever held in the Garden, young horses came north from Kentucky to comprise a catalog of 65 offerings. Breeders represented in the book included Col. W.S. Barnes of Melbourne Stud, Eliza J. Clay's Iroquois Stud, and Mrs. Byron McClelland among others. The New York Times described the maiden effort to be a slow-starting affair with workmanlike prices, but one that picked up momentum as the sale went along. Sydney Paget bought the sale-topper on behalf of W.C. Whitney, going to $2,200 (about $64,000 today, adjusted for inflation) for a colt by the sire Kingston. Thoroughbreds played a supporting role later that year when Fasig-Tipton held its signature “Old Glory” sale at the Garden in November, following the National Horse Show in the same building. Of most interest to Thoroughbred horsemen over the course of the 10-day auction was the complete 33-horse dispersal of California-based Palo Alto Stock Farm, owned by the late Leland Stanford, founder of Stanford University and Pacific Life Insurance Company. The Times declared the crowd that gathered for the Palo Alto dispersal to be the largest of the marathon sale, and one that participated in brisk bidding. Paget was back to bid on horses for Whitney, frequently butting heads with James B. A. Haggin, who was himself based in Northern California. Haggin was victorious on the dispersal's most expensive horse, the imported mare Gorgo, with a final bid of $4,000 (about $119,500 today). The evening's Thoroughbred offerings grossed $18,916 (about $565,000 today), and put Fasig-Tipton on-track to expand its interest in the breed in 1900 and beyond. From two days of Thoroughbred sales in 1899, Fasig-Tipton expanded to 28 days the following year, selling in New York, Kentucky, and Tennessee. Fasig-Tipton remained at Madison Square Garden until 1921, 18 years after Fasig's death, when it moved its “Old Glory” sale even further uptown to the Squadron A Armory on Madison and 94th Street. The company moved its offices off-site from the sale grounds, as well. This entry was posted in NL Article, Ray's Paddock and tagged fasig-tipton, horse racing history, Madison Square Garden, thoroughbred auction, Thoroughbred history, yearling auctions by Joe Nevills. Bookmark the permalink.